Home » Blog » HOW TO ORGANIZE A SUCCESSFUL CONFERENCE? One is the conference venue. Your selected venue should offer delegates every opportunity to be comfortable, stay connected with the outside world and active participation proceedings. By ensuring that your conference venue has all the facilities required to make your event work as your envisioned, you’re well on your way to turning your conference into a true event. 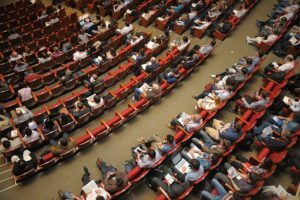 It can see silly from the outside but it’s true – what delegates take away a conference will stick with them for a long time, by creating useful item for your delegates, you’re essentially placing advertising for yourself and your sponsor in daily lives. And second is conference session, presentation and panel discussion, its importance to help conference attendees take home all that they’ve learnt and engaged with at conference. As a part of your planning, include creation of CD’s, DVD’S r USB tricks for each delicate, that will house all preparation and other resources. Except these two, there are some tips to keep in mind to get you the idea phase to hosting a successful events. Advance planning, brainstorm, budget, negotiation with vendors, choose your guest speaker, setting agenda, managing attendees, on-site details, and event bible. These are some of the best and important points to keep in mind while organizing a conference. If one follows these and make it unforgettable to attend, the event is enjoyed by delegates and ensures that the attendees want to return the very next time you host a event.